While there are months and months worth of posts I could make about the political state of America, ultimately the best use of my time is in keeping my home. Above you see my newest purchase. This is Claudette. 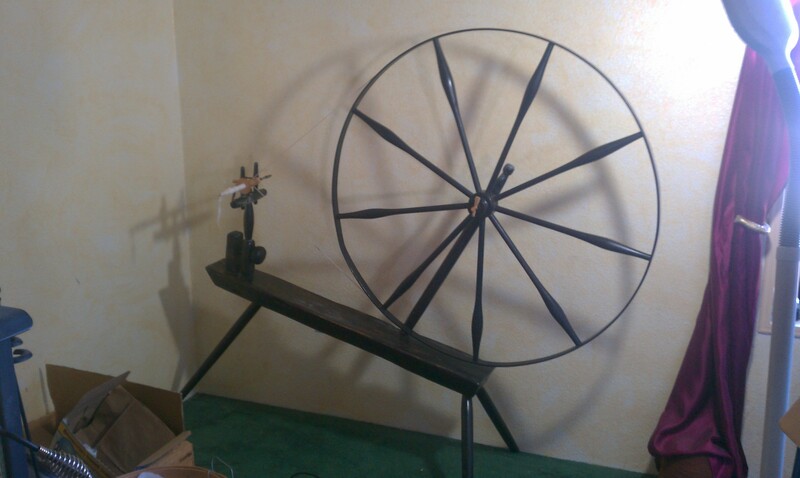 She’s a reproduction Appalachian style great wheel, 7/8 scale. I bought her from a man who used to make and sell them out of St. Michael’s in Prescott during the 70’s. This was his last one; he said if there were a demand he would begin making them for sale again so I gave his name and phone number out at my last guild meeting. Claudette has a learning curve akin to that of learning to spin on a traditional double drive wheel like Miss Saxony did. Meaning that, while children for hundreds of years *did* learn to spin on a wheel like this, it’s not the way I would teach a beginner now. Too much frustration for someone modern who hasn’t had the joy of creating yarn already. I did some research and discovered that, much like a fine stringed instrument, she needs rosin on her drive band to truly work well. I haven’t done that yet but I have a goal of being able to spin decently on her by the time the May Fair on the Square is upon us. I want to demo on her. I am ordering a custom spinning wheel; I finally paid more than the 50% down payment just this morning. Carson Cooper is the maker. Unfortunately he has not updated his website with a photo of the wheel I am ordering; it is called the Eirny and will have an accelerator on it that enables it to spin at ratios up to 50:1. Now for those of you who don’t know what a ratio is, it is the number of times the bobbin/flyer mechanism spins per one revolution of the drive wheel. On the great wheel above, the ratio is 40:1 but being a spindle wheel, it limits the type of yarn that can be spun. Miss Saxony has a ratio of approximately 7:1 because she was originally designed as a flax wheel. Flax, from which linen is made, is a very long fiber – 18 or more inches, very strong, and doesn’t need much twist to hold it together. Wool, or especially cotton, require LOTS of twist to hold them together. Wool not nearly so much as cotton due to the crimp inherent in most wools and the scales like human hair has. When I spun cotton on Miss Saxony, I was treadling like a hamster on a wheel to hold it together! It worked, but it would be nice to be able to spin it without working quite so hard. The main reason I am buying this custom wheel though has to do more with preparedness for what the future may offer. Quite simply, after having done the research, I want a wheel that will stand up to the test of time, and I want to support craftsmen/women who are keeping these crafts alive. Gods know we’ll need them in the future. This wheel truly incorporates the best of modern technology – brass bearings to reduce friction in the bobbins, and all the high speed turning areas – with traditional technology – hand turned wood, drive band made of traditional cotton cord. It’s going to hold up to the rigors of production spinning because it’s made by a spinner who is also a collector of antique wheels and knows what a spinner needs and wants in a wheel. It’s made with attention to detail, individually, by a craftsman who is fully aware that his wheels will be an heirloom to be handed down. That is what I thought I was getting when I bought my Mach 1 and is exactly what I did not get. It is ironic that I had to buy a spinning wheel nearly 150 years old to actually get a true production wheel, and to truly appreciate the technology. We are getting a trailer load of manure delivered next week; we have to mend ALL of the fencing thanks to the javelina. We can’t plant anything until we fix all the holes. Mr. Tin Foil said we need a crossbow and I am thinking that might be a very, very good idea – the ultimate silent killer of javelina! Roast game for dinner, anyone? After all, they are an invasive species. We decided we are not going to devote much space to tomatoes this year. Two years in a row, thanks to our weird (although probably new normal) weather we have lost 50 tomato plants to a late frost and had to start over. Because the new plants never had a chance to get established before the weather became brutally hot, they never really produced enough to make them worthwhile. Since I have been getting tomatoes in bulk from the coop anyway that will be our plan for this year rather than try to grow our own. We still plan to have a couple of roma plants, and the requisite cherry tomatoes in buckets as we do every year. We are going to devote more space to beans, peas, cucumbers, lettuce, eggplant, peppers, and lots of herbs and spices. We eat a lot of Indian food as well as Middle Eastern food and latitude/climate wise, we can grow much of our own spices. I don’t know how productive we’ll actually be, but it will be fun to experiment. Plus, I would like to grow herbs to tincture, to put into soaps and lotions, and to dry. Oh, and to dye with. I’m being honest but I can just hear the groans from Mr. Tin Foil when he reads that last sentence! We are also going to redo the garden beds again this year; last year we were spending upwards of an hour and a half a day to water the front and back. We are redoing the beds to incorporate drip irrigation into at least some of the beds. It just makes more sense, plus it’s water smart, and we will be able to expand into other areas that require hand watering with a significantly smaller time commitment. Mulch will hopefully play a much larger role this year as well. I plan to do some guerilla gardening in my next door neighbor’s yard; he is dead now but he left large, well-tended beds as well as mature grape vines and an apricot tree. I plan to fertilize the grapes and the tree with the manure we get, and to water the tree at least weekly. I am hoping to get a harvest from the tree this year. I may also plant corn in his beds as he used to do, though I don’t plan to water every day like he did. We’ll see how our garden goes first. I sold one of my looms to a friend; I just didn’t enjoy weaving on it very much. It opened up space and hopefully it will give many hours of enjoyment to my friend. I still have my home made monster that says she was made for me (or at least someone with the same name as me). She is in need of a little rehab but is still usable for the time being. I have a couple of projects in my head that need to actually get warped up — time is running out for Fair items! School is going well, grade wise. Interaction wise once again I realize that my background is vastly different than most of the people in my class, thanks to the fire and EMS career, and that I have a much more cynical and realistic outlook than they. I also am reminded that I am becoming a nurse practitioner for vastly different reasons than they are, mine having a lot more to do with making sure my neighbors have access to medical care for as far into the future as I can work, and focusing on preventative and herbal treatments that are affordable for all. I have been trying to stay off the internet except for a limited time each day. I find that I avoid doing what needs to be done by spending far too much time on political, apocalyptic, doomer, prepper, and other forums at the cost of my serenity and productivity. I just can’t get that involved if I want to maintain my GPA and my sanity. I also am finding I sleep much better if I limit my time – even watching netflix seems to affect my sleep quality. I’m not sure why that is but I do notice the difference. Something about the computer waves is affecting me, I just don’t know what, and life is better and more productive if I limit my time in front of it. I need to finish plying the yarn I made for my oldest son’s Cobblestone sweater. I made a lighter weight yarn than the original pattern called for, but that’s because he tends to keep the heat jacked up rather than putting on a sweater. I’m hoping it will make it wearable for him if it’s lighter. And yes, I know that it’s March and I was supposed to have this done by last Christmas! Maybe a combined Christmas/birthday present will happen. That’s all. I hope your gardens grow well, your spinning wheels spin true, and you are ready for the next step on the journey!